Beat the holiday boredom with a family-friendly holiday in Bundaberg. Watch the kids from your balcony at Bargara and Kellys Beach. Enjoy fish and chips on the beach, just walking distance from where you call home, or cook up a storm of fresh local produce and seafood in your self-contained apartment. With so many beaches along Bargara and the Coral Coast you are sure to find accommodation just seconds from the water to suit all your family needs (especially the need to be at the beach all day!). Try: Sleep metres from the beach at Bargara Beach Caravan Park and enjoy the calmness of this family-friendly camping and caravan park. Relax at Sandcastles on the Beach while the kids play with beachfront views of Kellys Beach. A day out on the adventure-filled islands of Lady Elliot and Lady Musgrave is a kid's dream. Snorkel with colourful fish and vibrant coral, swim with friendly turtles and experience the pure wonderment of the giant manta rays. Try: Take a glass bottom boat tour with marine biologists and spend a day swimming with the turtles with Lady Musgrave Experience. Stay for a night or five at Lady Elliot Island Eco Resort and experience all the adventures the island and reef have to offer. Aviation pioneer Bert Hinkler is honoured and celebrated at Hinkler Hall of Aviation. Come uncover the history behind this remarkable man who flew successfully off Mon Repos Beach (where we see nesting and hatching turtles from November – March). Try: Fly like Bert Hinkler on a flight simulator at Hinkler Hall of Aviation or learn the Hinkler Quickstep for the next school dance. From a massive playground along the Burnett River to a reptile-shaped playground on the beach, Bundaberg and Bargara have you covered for those moments when you need the kids to burn off some steam or if you're simply looking for a shady spot for some lunch. Try: Alexandra Park and Zoo can entertain the kids for hours. A small but engaging zoo with a free petting zoo often open during school holidays, but the real highlight is the playground. Situated beside the Burnett River offering a cool breeze and plenty of shade, this playground is HUGE and will keep the kids entertained for hours! Staying in Bargara? Watch the sun go down with fresh caught reef fish and chips at the Turtle Park while the kids explore the turtle-shaped playground. We do fresh, healthy produce best, so you can claim your "parent of the year award" right now. Our local cafes deliciously adorn their menu with the best of the best and the freshest of the fresh, with fussy eaters not a problem at all. Try: Sports clubs are a great place for families and The Waves Sports Club is a cut above the rest! 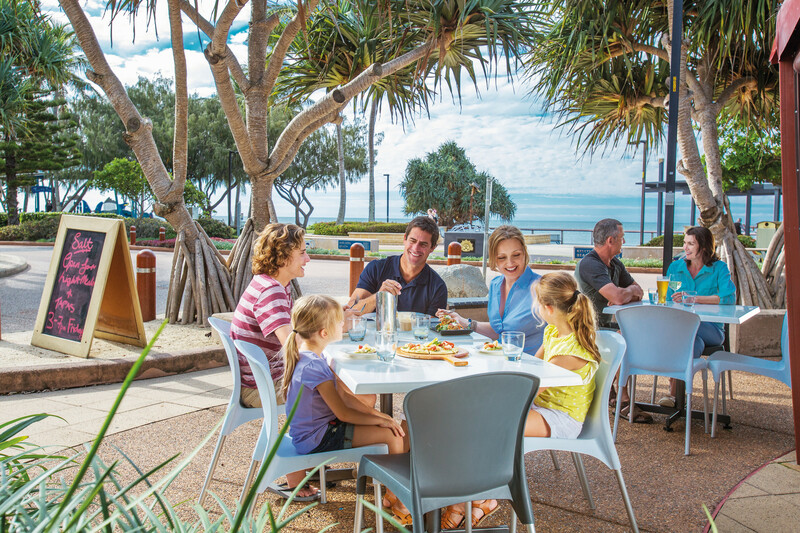 Enjoy a fresh, local-caught seafood platter and a much-deserved Bundaberg Rum cocktail while the kids enjoy themselves in the Kids Zone. Dig into the fluffiest pancakes (Japanese-style pancakes!) you've ever seen at City Elements (check out the photo below! ), sure to be a crowd favourite with the kids, or treat the kids to a monster shake (and yourself to a coffee) after a big day of exploring.